Q: Today President Xi Jinping had a telephone conversation with President Moon Jae-in of the Republic of Korea. Does this signal the improvement of the bilateral relations? A: Today, President Xi Jinping had a telephone conversation with President Moon Jae-in. We have already released relevant information. During the conversation, President Xi Jinping congratulated President Moon Jae-in on winning the election and pointed out that as close neighbors, China and the ROK have made big strides in the bilateral relationship since the establishment of diplomatic ties 25 years ago. Both sides should stay true to what we were committed to when we established diplomatic ties, respect each other's major concerns and legitimate interests, seek common ground while properly addressing differences for a better China-ROK relationship. This is in line with the common interests of our people and conducive to regional peace, stability and development. President Moon Jae-in said that the ROK attaches great importance to its relations with China. The ROK will work with China to develop the bilateral relationship at a high-level and promote the practical strategic cooperative partnership. 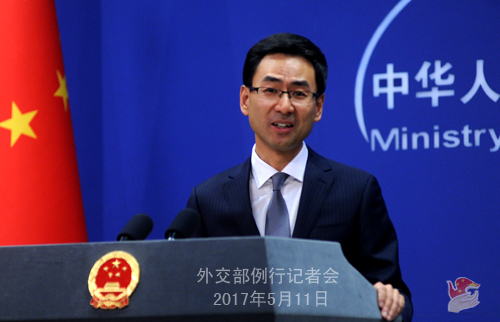 The ROK thinks highly of China's Belt and Road Initiative and expects the initiative to bring development and prosperity to China, the ROK and other countries and regions along the routes. What I want to say is China is ready to work with the ROK to bring the bilateral relations back to the track of healthy and steady development. Q: Chinese and ROK presidents talked about meeting each other in today's phone call. Was the timetable discussed in the conversation? A: In the conversation, the two heads of state agreed to maintain contact and expected an early meeting. Q: According to media reports, Philippine President Rodrigo Duterte said he had appointed Chair of the Senate Foreign Relations Committee Alan Peter Cayetano as the new foreign secretary. What is China's comment on that? What is China's expectation for working with Foreign Secretary Cayetano to develop bilateral relations? A: Since last year, with the care and guidance of the two heads of state, the China-Philippines relations have achieved all-round improvement and bilateral cooperation has entered a new stage. Cooperation across the board has recovered and yielded fruitful outcomes. Our relationship is making overall progress. We welcome the appointment and congratulate Mr. Cayetano. China is ready to work with him to implement the high-level consensus and keep deepening practical cooperation to push forward China-Philippines relations for greater benefits to our peoples and regional peace and stability. Q: Reports say that 29 heads of state and government will attend the Belt and Road Forum for International Cooperation, one more than what we were previously told. Which country does the newly added head of state come from? Q: The Russian ambassador to China said that President Xi Jinping is going to visit Russia early July. Can you confirm this information? A: You should know that the two heads of state have very close exchanges. As for the Chinese president's visit to Russia, we will release the information in due course. Q: Chinese banana growing companies in Laos have been prevented from planting new plantations because the government there is concerned about the overuse of fertilizer. I am wondering if China and Laos are in communication on this issue. And in the context of the Belt and Road, does China need to properly address this kind of thing regarding its investment abroad? A: I have no knowledge of the case you mentioned. But I think there is no need to make this kind of far-fetched link between a very isolated case and the Belt and Road Initiative. In principle, we always ask Chinese enterprises abroad to follow the local laws and regulations, fulfill their social responsibilities and protect the local environment. At the same time, we hope that the legitimate rights and interests of Chinese enterprises can also be protected. Q: Russian President Vladimir Putin will come to China for the Belt and Road Forum for International Cooperation. What is China's expectation for his visit? On what issues will the two sides exchange views? A: President Putin is invited to attend the Belt and Road Forum for International Cooperation. Russia has expressed welcome and support for the Belt and Road Initiative at a very early stage. In fact, the two countries always maintain sound communication and coordination and enjoy close cooperation in this regard. As far as I know, President Putin will hold talks with President Xi Jinping during the forum. The two sides will have in-depth exchange of views on bilateral relations and major international and regional issues of common interest. As I said when answering the question from your colleague, the two leaders maintain close exchanges. Regular meetings between the two sides are of great significance to deepening the China-Russia comprehensive strategic partnership of coordination. Q: The upcoming Belt and Road Forum for International Cooperation has drawn world-wide attention. Could you please update us on the preparation work? A: This morning, secretary-general of the preparatory committee of the Belt and Road Forum for International Cooperation, Vice Foreign Minister Li Baodong gave an interview and talked about the preparation work. His key message was: We are ready! Up to now, 29 heads of state and government and three leaders of major international organizations, including the secretary-general of the United Nations, will attend the Leaders Roundtable and other activities. Around 1,500 guests from over 130 countries will attend the forum as official representatives, and over 4,000 journalists around the world have registered to cover this forum, all of which are unprecedented. The forum will provide various activities, including the Opening Session, Leaders Roundtable and High-level Dialogue. On the morning of May 14, President Xi Jinping will attend the Opening Session and deliver a keynote speech. After that, there will be the high-level plenary. On the afternoon of May 14, there will be six thematic sessions on five types of connectivity and think thank exchanges. On May 15, President Xi will preside over the roundtable, which includes two sessions and a working lunch. After that, President Xi will meet the press to talk about the major outcomes of the forum. Moreover, China and participants to the roundtable will issue a joint communique, which will reflect their consensus on building the Belt and Road. 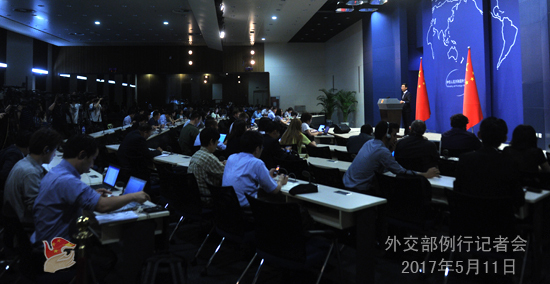 During the forum, participants will synergize development strategies and work for a series of cooperation outcomes. A number of cooperation documents will be signed at that time. All in all, China would like to take this forum as an opportunity to have extensive consultation with like-minded partners about cooperation, make joint contribution to building an open platform and share the benefits brought by development. Let us expect a great success of the forum! Q: Do you have any update on when the precise schedule, the program of the forum will be published? Who will represent the EU? Will it be the president of the Commission, or only the vice president? A: I only have a framework schedule. I can tell you that the media center of the forum will be operating from May 12 to 15 at the National Convention Center. They will provide more detailed information on the forum. As for the attendance of the EU, you asked a similar question yesterday. As far as I know, there will be EU representatives attending the forum. Q: Do you know who it is? A: There will be EU representatives attending the forum. Q: According to what we know, President Moon Jae-in will send a special envoy to China to discuss the THAAD issue and the Korean nuclear issue. Can you confirm this information? Will China invite representatives from the new ROK administration to attend the Belt and Road Forum for International Cooperation? A: During today's conversation, President Moon Jae-in proposed to send a special envoy to China at an early date. China welcomed his suggestion. President Moon also said that the ROK thinks highly of the Belt and Road Initiative and expects the initiative to bring development and prosperity to China, the ROK and other countries and regions along the routes. If there is any information about high-level representatives of the new ROK administration attending the forum, we will release in a timely manner. Q: My question is about the major traffic accident which caused the death of some Chinese and ROK children in Weihai, Shandong Province on May 9. Could you please update us on the latest developments? A: Yesterday I briefed you about the relevant situation. As far as I know, relevant departments in Shandong Province and Weihai City are pushing forward investigation into the accident and properly dealing with the follow-up matters. 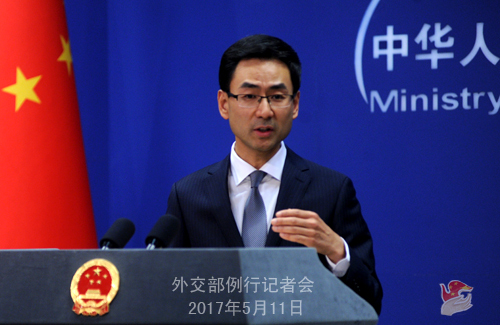 China stays in touch with the ROK through diplomatic channels. Today, in his telephone conversation with President Moon, President Xi mourned for the Chinese and ROK children killed in that accident, and asked President Moon to convey his condolences to the bereaved families in the ROK. President Moon thanked President Xi for his condolences and the swift response by the Chinese government to deal with the accident and the aftermath. Q: You said before that China expects to bring the relationship with the ROK back to the track of sound and steady growth. What are the specific measures that China is going to take in order to make the relationship go back to the track? A: During today's telephone conversation, the two leaders expressed the great importance they attach to the relations between China and the ROK, and their willingness to jointly advance the bilateral relationship. 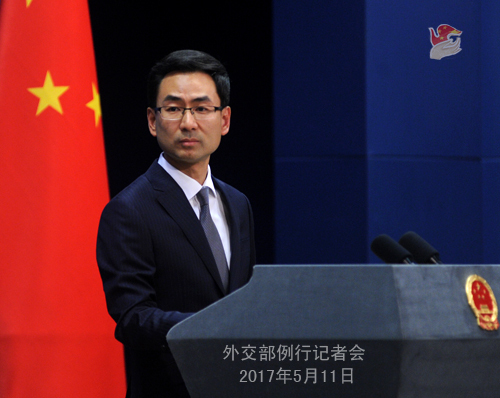 Going forward, China will maintain close communication and contact with the new ROK administration and work in concert with them to bring the relationship back to the track of healthy and steady development as soon as possible. Q: Reports say that the United Nations Human Rights Council reviewed the human rights situation in the Philippines and that some countries expressed concerns about the human rights conditions in the country. What is China's comment on that? A: On May 8, the 27th Session of Universal Periodic Review of the United Nations Human Rights Council reviewed the human rights situation in the Philippines. Over 100 countries made remarks. Most countries including China, Russia, Cuba and Venezuela made positive comments on and commended the efforts and achievements made by the Philippines in eliminating poverty, promoting socio-economic development and improving and protecting human rights. The Universal Periodic Review is an important mechanism for UN member states to conduct dialogue and cooperation on an equal footing in the area of human rights. We hope various parties can be objective and fair in viewing the human rights conditions in different countries and promote the human rights cause through dialogue and cooperation. Drugs are the common enemy for all human beings, bringing pains to many developing countries, including China. China supports President Duterte and the Philippine government in combating drug-related crimes in accordance with the law. We hope the international community can respect the judicial sovereignty of the Philippines and support its efforts in fighting drug-related crimes through cooperation. Q: My question is about Spanish Prime Minister Mariano Rajoy's visit to China for the Belt and Road Forum. He will meet with President Xi Jinping and Premier Li Keqiang. I want to know if you can give me some details on what will be the topics of their discussion, and what are the arrangements for their meetings. A: Everybody is very interested in the arrangements during the forum. We will have many distinguished guests, so we are still coordinating with them to make proper arrangements for their activities. For the meetings and talks between President Xi or other Chinese leaders' and the foreign guests, according to the usual practice, we will release relevant information in a timely manner.